Home-based Christmases appear to be falling out of favour as families look to get into the festive spirit with a December getaway. According to ABTA members, trips to Lapland have increased by 14% compared to last year, while other options such as the Northern Lights, Christmas markets and winter wonderland-style breaks have also seen a surge in demand. And while parents can whisk their kids away for just one day to meet Father Christmas and play in real snow, holidaymakers seem to be enjoying longer periods of time away from home too, while trying to fit in as many activities as possible. Lapland is the most popular destination for some family-friendly festive fun, but travel agents have also seen an increasing demand for couple-based wintry getaways, with activities including reindeer sleigh rides, snow-mobiling and ice fishing. Experienced and novice skiers are also heading to the slopes of Lapland, with as many as 40% of those travelling to the area opting for some cross-country or downhill adventures. Victoria Bacon, head of communications at ABTA, said: "Festive breaks have been growing in popularity in recent years and travel companies have really responded to this with the wide range of holidays and activities now on offer. "A real trend ABTA is seeing is holidaymakers looking for experience-led holidays and these festive getaways are a fantastic opportunity for people to create long-lasting memories." Other popular breaks include a trip to see the magnificent Northern Lights, a light display sure to leave holidaymakers mesmerised. Those seeking this particular trip should look at deals in Sweden, Norway, Finland, Greenland, the Svalbard islands, Alaska, Canada and Russia. 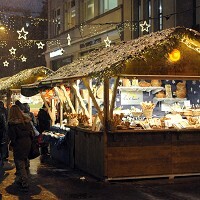 Meanwhile, many European towns such as Zurich can get you in the Christmas mood with markets offering a range of festive gifts and food.